We cannot thank the Lawrence Arts Center enough for extending the invitation for ArtsFI to perform again in Lawrence this September! We are excited about our new concert inspired by the poem by Walt Whitman, The Sleepers. We are especially looking forward to sharing our unique educational workshops with the students in Lawrence. We hope you enjoy a few images and a few clips of video footage from our time in Lawrence! The dancers of LAC circle up with AFP dancers Cleo Person, Taylor Hansen and Kyle Weiler after the dance workshop at LAC. 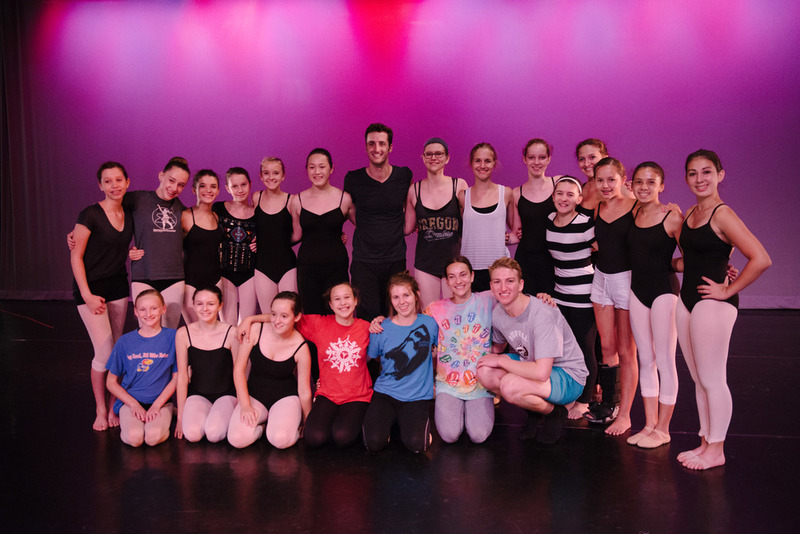 The dancers of LAC pictured here with Hanan MIsko (Juilliard Dance Alum) and AFP dancers Cleo Person, Taylor Hansen and Kyle Weiler. Friday morning post-show brunch at Milton's was a must-do for the first-timers in Lawrence. Needless to say they loved it! Jake's faces tell the whole story at Free State High School in Lawrence, but not really. Outside of Milton's Cafe in Lawrence, Kyle was doing a bit of sidewalk improv. Never a dull moment with Kyle - we love him!